There is a really good chance that on your Mac, the WiFi management section is the area you access most frequently. This is particularly true if you travel regularly and need to connect to different WiFi networks at different locations. You might find yourself switching between different WiFi networks, to use the one with the most signal strength. You might also face various WiFi connectivity problems, in which your system connects to a network with less signal strength than another one in the nearby vicinity. 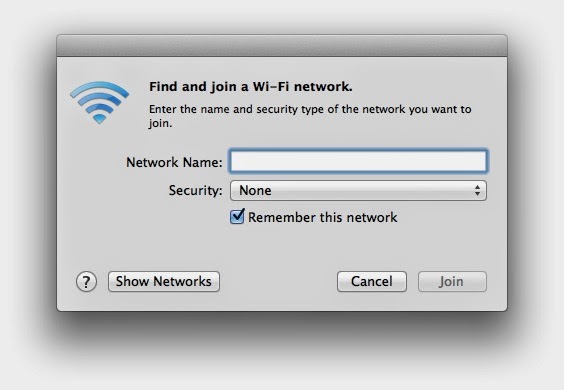 Here are some useful tips for you on how to effectively manage WiFi networks in OS X. This will bring up a dialog box similar to the one above, where you can easily enter the Network name and password (if there’s one) and connect to the network. Our second tip for managing networks is that you should remove any that you do not use, or do not wish to use. This is most effective in situations when you have a massive list of available WiFi networks, but only want to connect to the ones that are the strongest. 1. Open up System Preferences from the Apple Menu. In the Advanced panel, select the WiFi tab and you should see a list of all the networks you’ve ever connected to. To remove unwanted networks, simply select one or more than one network (Hold down “Shift” or “Command” to select multiple networks) and click on the “-” sign to remove them. To prioritise networks, you can simply drag networks to fit your specific order, to give priority over one another. In this manner, you can locate the networks you connect to by name, and then select and drag them above others that might be connected by the system preferentially. When you’ve finished with all these settings changes, simply click on “OK” and close System Preferences to save the changes.